The Fisher Scientific Fixed Speed Vortex Mixer has simple to use touch mode operation that begins mixing when the cup head is pressed down. This vortex shaker is set at full speed, 3200 rpm, for vigorous vortexing. There are no controls to set and no counters to watch. The shaking orbit on this vortexer is set at 4.9 mm. This vortex mixer also has a cast metal body with a durable powder coat finish, with just enough weight to keep it from walking. 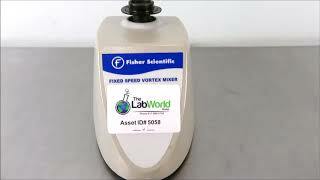 This Fisher Scientific Fixed Speed Mini Vortexer has been thoroughly tested and performed as expected. All of our lab equipment comes backed with our standard warranty. Should you have any questions, please don't hesitate to contact us.